India 25 September 2016: Guava is loaded with vitamins and minerals. Guava has a healthy composition of dietary fiber that is vital for the body and can be got only from food sources. Guava fruit (Amrood) contains three times more protein, four times more fiber compared to pineapples. Guava is rich in folate and fulfills about 20% of our daily folate (Vitamin B9) requirement. Guava is so rich in Vitamin C that it contains 628% of your daily requirement. Guava also contains twice the amount of lycopene than tomatoes. 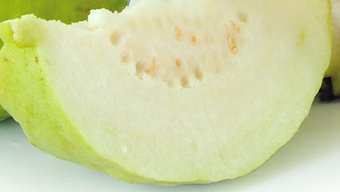 Vitamin A content of guava fulfills about 21% of daily requirement. Guava also contains other vital nutrition like Magnesium, Manganese, Potassium and Phosphorus. With all the nutrition loaded in it, guava hardly contains any fat.